1.1. “Doing” Psychology: Thinking and Operating with a Subjective Concept of Work One point of departure for confronting this problem is the idea of well-being, or mental health—the description of subjects at work and who they really are. To individuate the aims of organization, the economy, and the political future, we must define, also operatively, what is meant by subjective well-being and mental well-being. Hence, the point of departure might consist of the following questions: How do we evaluate the efficiency of economic and political structures, and how do we evaluate the social artifacts produced by the subject? 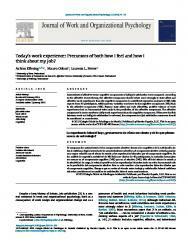 How can we make the very most of human resources and of subjective and psychic well-being? These questions propose a change in the function of psychology, which thus represents today in Italy an application of subjective and psychological technology to the management of social and human development. They also propose an acceleration of development processes. Accordingly, work and organizational psychology (WOP) is suggested as a science of active human options. 1.2. The History of the Psychology of Work At the end of the nineteenth century, work ceased to be simply an instrument of mechanical energy. With the rise of collective rather than individually owned enterprise, the protagonists of the work process could be defined. Workers began to be protagonists, not simply conductors of mechanical energy, and became the opposition to the other protagonist, capital. Thus began the long struggle for the distribution of the results of production that is known as the industrial conflict. Both Munstenberg (Freiburg, 1915) and Patrizi (Modena, 1889) organized laboratories of psychology applied to work. During World War I, American psychologists made a very important contribution in October 1917 by preparing the first two tests of mass selection: Army Alpha (for the literate) and Army Beta (for the illiterate) were used to choose the soldiers that went to war in Europe. In that same year, Agostino Gemelli in Italy also prepared a system of military selection. In 1920, Charles Myers founded the National Institute for Industrial Psychology (NIIP) in London. Also in 1920, at the Charlottenburg High School near Berlin a laboratory of psychology was founded by the German trade union, while in Geneva the Associazione Internazionale di Psicotecnica (which became the Association Internationale de Psychologie Appliquée (AIPA)) was founded by Claparède and Walter. A fundamental contribution was made in 1927 at Western Electric in the United States, by Elton Mayo. To this psychologist and his two students Roethlisberger and Dickson we owe the first great research into the psychology of work. On April 25, 1927, Mayo initiated his experiments at Western Electric’s Hawthorne plant, with the room tests for the electrical industry assembly line. The 1929 financial crises caused the psychological point of view to recede, and the dictatorships taking power in Europe in those years blocked subjectivity. The psychology of work moved to the United States, and was supplanted in Europe by silence. Subjectivity was constrained to submit to a special rapport with economic power, to which it was considered vulnerable. Then began the liberation of psychology from economic power. The dictatorial European regimes had rejected psychology as dangerous for its subjective nature, and it was therefore only during the aftermath of World War II that psychology began to reassert its autonomy from the economy. Thus, we can distinguish four periods in the evolution of the psychology of work: 1. An interpersonal period, from 1945 to 1963, beginning with the reconstruction of Europe and Italy and continuing until the creation of Students for a Democratic Society (SDS), and the beginning of criticism of the productive systems in use. The interpersonal period saw the emergence of human relations. It was in 1945 that Division 14 (Industrial and Business Psychology) of the American Psychological Association was founded. Kurt Lewin launched the journal Human Relations and the Center for Human Relations in 1947. In 1963, the Association Internationale de Psychologie Appliquée was called also International Association of Applied Psychology (IAAPAIPA). 2. A “hot” period, from 1963 to 1970, during which an array of proposals for models of individual and collective subjectivity were developed (hence the era was considered “hot”). The study and use of small groups between 1966 and 1968, and the revolts of students and workers between 1963 and 1970 did not permit the subjective dimension to express itself practically in the world of work. Theoretically, interest in subjectivity was emerging, but practically it was being eliminated as too scientific and utopian, and as enslaved to power. This creative, stimulating period was characterized by the transition from pair psychology to that of small groups, or even to large ones or collectivity. 2.1. Measuring Some Psychic Variables (see Methods in Psychological Research) Work organization is a perception; workers learn about their own subjectivity by means of specific measurement. By measurement, we mean the association of symbols or numbers to empirical facts with the aim of obtaining greater tractability of the data. This 1951 definition by Stevens underlines the scope of psychic measurement, which is the tractability of the data, not simply their verification, and much less so their quantification. Therefore, to measure a psychic variable, it is not necessary to quantify it; rather it must be made tractable. The problem of interview techniques is crucial in the psychology of work, because without interviews it is impossible to study either people as a resource, or subjectivity. In fact, it is impossible to know people’s subjectivity without entering into a relationship with them. Psychological knowledge always occurs by way of a relationship; we cannot know others, we can only know our relationship with them. We derive from it something that can be called the “principle of psychological indetermination.” This means that since we cannot know someone without entering into a relationship with them and since by doing so we modify that person, we can never know another person as they were before entering into a relationship with us. This uncertainty principle, apparently insurmountable, admits of only one solution: we can know in what way we modify the other people we know. We can reconstruct, by way of our knowledge of others, the characteristics that they had before entering into a relationship with us. From this stems an important consequence: the affirmation that the most sensitive, valid, and reliable instrument of measurement is the individual person— a calibration that requires paying the greatest possible attention. One preliminary concept is the distinction between the contents and the characteristics of the people interviewed. The contents are the things that get transmitted or communicated during interviews, while the characteristics of the people interviewed are the deductions that one can make from the contents with respect to those people. Another preliminary concept is the distinction between the contents and the processes. The contents are, as we have seen, the things talked about during the interview. The processes are the ways in which these contents get treated. It is also important to be aware of distinctions between the motivations of the interview, which can be intrinsic (having to do with the individual interviewed), or extrinsic (having to do with the interviewer). If an interview has an intrinsic motivation, it is called a colloquy; if it has an extrinsic motivation, it is called an interview. In reality, psychological interviews are those with an intrinsic motivation, even if no interview has a single motivation. The skill of an interviewer rests in transforming each interview with an extrinsic motivation (such as selection) into an interview with an intrinsic motivation (see Interviewing and Observation). 2.3. Psychological Tests A test is a statistical sample of a subject’s behavior from which one can statistically infer broader or even global behavior, another behavior, or a future behavior or state of being. Each test, then, has its own way of collecting a behavioral sample, its own capacity of inference, and its own constancy in time. These three characteristics, which constitute the technique of constructing a test, are called: choice and analysis of the test items, efficiency and utility of the test, and its reliability. the non-structured group called “T-group,” or training group (basic and nonmanagerial), was born. In 1954 during the Korean War, Bales and Slater realized that American aircrews who had had group training were not shot down by enemy anti-air artillery. Thus, the concept of differentiation of leadership and plural command was born, with the consequent invention of task forces (groups with multiple leadership), and the idea of organization by matrix. Biographical Sketch Enzo Spaltro was born in Milan on July 3, 1929. He graduated in medicine (1953) and took up specializations in work-related medicine at the University of Milan (1955) and in the psychology of work at the Catholic University of Milan (1957). He held the positions of assistant, Institute of Psychology, Catholic University of Milan (1955–1959); research assistant, Institute of Psychology (1961) and Social Psychology (1966); professor of social psychology (1961–1967) and of work psychology (1967–1970), Catholic University; professor of work psychology, University of Trento (1968–1970); tenured professor of work psychology, Department of Political Science, University of Bologna (1970 to the present). He was a lecturer in psychology (1960) and in social psychology (1966). http://pamplonita.colciencias.gov.co:8080/gruplac/documentos/InstruccionesGenerales.pdf. EnrÃ­quez, A., & CastaÃ±eda, D.